You get the picture. Some veggies just aren’t ideal crops for a kid’s first garden. Children love to graze, and you’ll want to encourage them to enjoy the fruits of their labor. Although there will be exceptions for some kids who really love broccoli or spinach, for first-timers, have a look at our Top 10 Veggies for Kids to Grow. Onions and garlic – yuck, Mom! For specific projects like pizza gardens where the objective is to harvest ingredients that go into making a finished meal, some ingredients in the list above would not apply. Wow! Thanks for the tips! My children love to help in the garden and I literally have to fight them off when preparing fresh salads, lol! Enjoy the battle – I love it! While I agree that high maintenance crops and those that need expertise and too much patience are not good choices for kids’ gardens, I completely disagree about selecting for crops that kids favorite anyway. 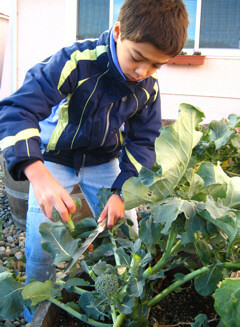 One of the many reasons to grow a kids’ garden is to get kids to love their fruits and veggies. They’ll get to taste and love them through cultivating them! Knowledge of the plant will garner interest and at least a trial. Spinach, broccoli and zucchini are delicious, especially if freshly picked, and if we parents show we like them, grow them and serve them often, our kids will think so too. Another favorite to grow with kids are herbs. You don’t even need a garden for that. Herbs are sensual, easy to grow and add a lot to any dish. You can’t munch right from the garden anyway, even from an organic one. All crops need a good wash, so the fact that a vegetable needs to be cooked shouldn’t exclude it from a kids’ garden. There are many ways to cultivate a child’s love for veggies. We’ve never made a big deal about “eating veggies” b/c they were always on the table from day one! To this day, it amazes me how much our son loves all those “icky” plants, and now grows his own Kettle River garlic! Alas, not all children have the benefit of guidance and time that many parents/caregivers are able to devote in helping them appreciate growing their own veggies. So our suggested lists were intended as a gentle way to introduce kids and their parents to a limited number of edibles. The lists are by no means comprehensive nor apply to every family! Thank you for sharing your comments. It is good to know which plants are labor intensive or really delicate– because I think success in the garden leads to continued gardening! I can’t wait to see what we grow this season! Jenni, very true. At our local school garden, I see a whole bunch of mature, unpicked swiss chard. Why, I ask, when this is not only a handsome, but also delicious veggie? It is yummy sauteed in olive oil and garlic, and perfect as a layer for lasagna! The young, less bitter shoots could probably be tossed in salads, too. So yes, the easier-to-care-for veggies are a great idea, and even better when they’re actually picked for a meal or snack! Would also like to add that I have a weakness for buttercrunch lettuce and think that is a definite winner for kids, too!